Jessica Alba is one of the wealthiest self-made women in United States, and it’s not just because of her acting. The 35-year-old actress is the co-founder of the all-natural product brand, The Honest Company, which was reportedly valued at $1.7 billion. Jessica was recently invited to Martha Stewart’s American Made Summit to talk about her success and entrepreneurial ventures. The mom-of-two made her presence felt as she arrived at One World Observatory in New York City on Monday. She donned a multicolored striped pencil skirt by Lela Rose teamed with a black sleeveless top to showcase her enviable figure. Jessica accessorized with just a pair of large hoop earrings and black pumps, keeping the look simple. She wore her tresses down in loose waves and sported pink lipstick to complete her look. Jessica selected the Kurt Geiger “Bond” pumps for her feet. 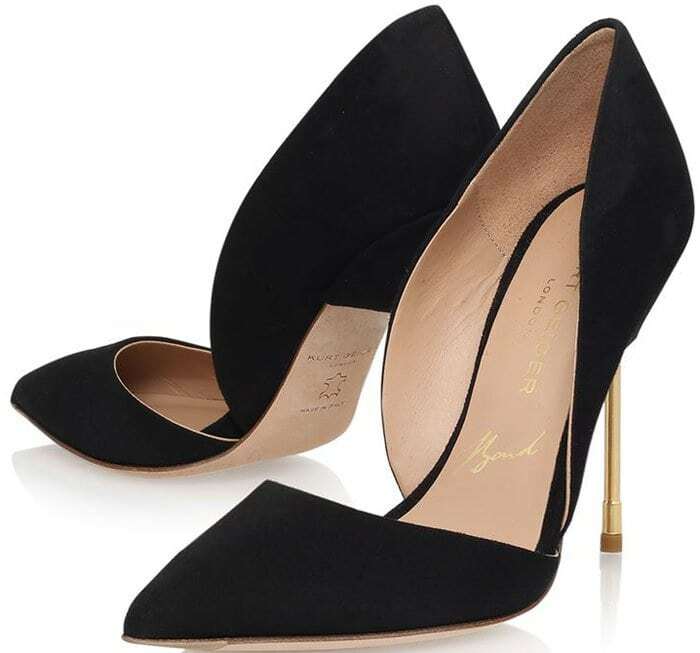 These black suede pumps feature a d’Orsay silhouette, pointed toes and about 4.5-inch metal cigarette heels. Get these classic-modern pumps at Kurt Geiger.